The body was identified as that of Suspect James Todd Brown, who was wanted in connection with a triple murder that occurred on the 1100 block of West Avenue N12 in Palmdale on Saturday, January 13, 2018, at approximately 3:50 P.M. The vehicle that the suspect was located deceased in was confirmed to be the vehicle he was suspected to have been driving. The cause of Suspect Brown’s death is unknown at this time, pending the outcome of a medical exam by the Los Angeles County Department of Medical Examiner-Coroner. There were no obvious signs of trauma to Suspect Brown. 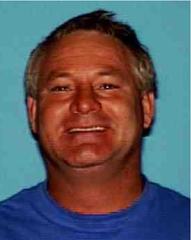 Los Angeles County Sheriff’s Department Homicide Bureau Detectives have issued a Murder Warrant for James “Todd” Brown, who is wanted in the Triple Murder of a family in the unincorporated area of Los Angeles County near Palmdale. The victims were located on the 1100 block of West Avenue N-12, Saturday, January 13, 2018, at approximately 3:50 p.m.
Investigators have learned that the suspect, James “Todd” Brown, lived on the victim’s property in a trailer for approximately 2 years while doing odd jobs for the victims, as well as in town. It appears that the suspect and victims got into a dispute that escalated to murder. Suspect Brown is described as a male White, 54 years-old, 6’00” tall, 265lbs, with brownish gray hair and brown eyes. 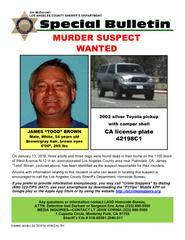 He might be driving a 2002 Silver Toyota Tacoma Pick-up truck with camper shell, license #42198C1, CA. Suspect Brown was formerly listed as a Person of Interest by detectives, however, based on evidence collected and information obtained by investigators, they have now listed him as the murder suspect. The three victims were stabbed, suffocated and beaten to death in their home. Their dogs were also found beaten to death. They were discovered when the family asked for a welfare check. Deputies went to the residence and found the victims. They have been identified as 78 year-old Richard Gardner II, his wife, 56 year-old Pepper Gardner, and son, 52 year-old Richard Gardner III. Detectives and family members of the victims are asking for the public’s help in locating suspect Brown. We need to get this very dangerous suspect off the streets. Suspect James “Todd” Brown is considered dangerous. If you have information regarding this incident, please contact detectives. If you see him or know where he is, please call 9-1-1 immediately. Los Angeles County Sheriff’s Department Homicide detectives are continuing their investigation into the triple homicide that occurred in the 1100 block of West Avenue N-12, Palmdale, on Saturday, January 13, 2018, at approximately 3:50 P.M. The three victims have been identified as 78 year-old Richard Gardner II, 56 year-old Pepper Gardner, and 52 year-old Richard Gardner III. Sheriff’s Homicide detectives have identified James “Todd” Brown, as a person of interest. Detectives believe Mr. Brown may have information regarding the murders. According to detectives, Mr. Brown was living on the property for at least one or two years. 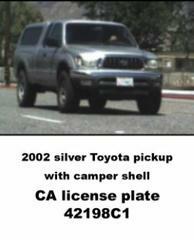 Detectives are also looking for a 2002 silver Toyota Pickup with a camper shell, CA License #42198C1. Detectives have confirmed the vehicle is registered to Mr. Brown. Neighbors, family and friends have informed detectives that it is the vehicle Mr. Brown typically drives. It is unknown where Mr. Brown is at this point but he has family and friends that live in the Inland Empire and Antelope Valley.